It’s been more than 60 years since independence and despite the exile of the Brits from the Country; they leave behind a trail (language) which is still ruling us. I am very saddened and appalled by the fact that a language which is merely a medium of communication or rather passing of info. from one person to another could be a yard stick for judging the calibre of a person. 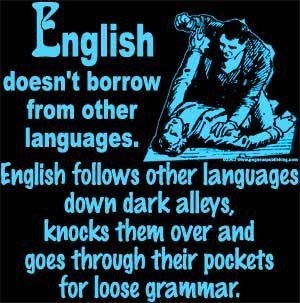 It is also ignominious fact that people who speak English are only considered to be well educated where as, others who in spite of having worldly knowledge are considered to be illiterates. Brits used English as a tool to divide and rule our country. But, why are we still falling prey to it? We should be proud of our own indigenous language and should take a lot of pride in speaking the same. It is my duty to bring to your notice that the language which we all are fascinated to speak (English) is not even a widely spoken language and only two of the leading countries England and the U.S widely use it. Why should we give so much importance to a foreign language and ignore our very own? On top of it why should it be a yard stick for determining one’s future? It is agreed that English is widely acclaimed business language but in Country like India it is considered to be a language of sanctity. One should also be aware of the fact that Japan, China, France, Germany etc which are also leading economies in the world does not take pains to learn English, then why should we alone? How many of us are aware that a lot of talent in rural India is wasted just because they do not speak English. It is also reality that a lot of talented people who do not speak fluent English are not preferred for top spots. Isn’t this a matter of concern? This is indirectly hitting the development of our country. India is a self sufficient country and we have it in us to be a developed nation. It is just that we are giving a lot of attention to foreign matters without realizing our own potential. We need right people at right places and this is possible only if we can clear the roadblock in the name of language(English here). Last but not least, it is not how you communicate that matters, it is what you communicate that is imperative. Let not a language like English be an instrument for weighing the calibre of a person.Let us allow sheer talent to rule the world and not the language.